Is Builder Sentiment a Better Predictor of the Apartment Investment Cycle? Are apartment builders better predictors of the Apartment Building Investment Cycle? Based on the latest cycle at least (a sample of one, admittedly) it appears that they are. 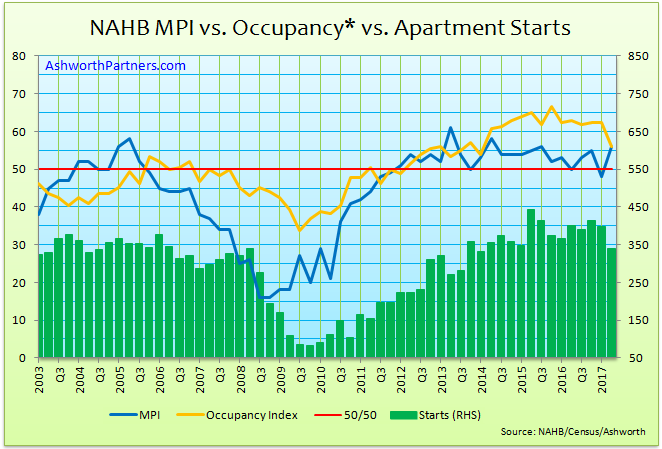 On the chart above the blue line represents the NAHB’s Multifamily Production Index (MPI) which began falling in the 3rd quarter of 2005 and fell for four straight Continue reading Is Builder Sentiment a Better Predictor of the Apartment Investment Cycle? Posted on September 1, 2017 Categories Apartment Building Investment Cycle, Multifamily InvestmentsTags apartment building investment cycle, apartment vacancy, Census Bureau, Multifamily Production Index, NAHB, supply2 Comments on Is Builder Sentiment a Better Predictor of the Apartment Investment Cycle?